Is it just me, or is anyone else starting to get confused by all these redesigns of our currency? They're designed to foil counterfeiters, but with all these changes, I personally can't keep track of what REAL money is supposed to look like any more! Okay, the new security enhancements may be easily detectable by machines, and may make it harder to make a $5 bill into a fake $100 bill, but if money doesn't look the way we think it's supposed to, doesn't it make it much easier for the average person to be fooled by counterfeit bills? This is very superficial, but I'm glad to finally see some color on American money. I've made several trips to Mexico, and their money is beautiful, different colors for different denominations and also celebrating their heritage with famous people from their history on them. The only thing that confused me is that I don't see any of the redesigned currency. All the bills I have don't have any color on them. 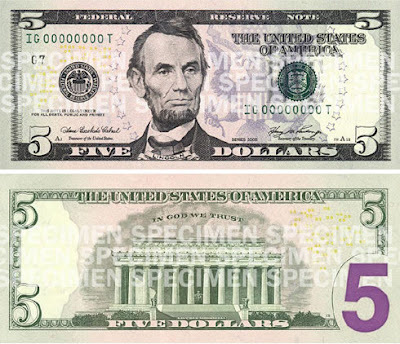 The treasury goes to the trouble of putting color on the bills and then they keep the old colorless bills in circulation? Why bother in the first place? In Canada we have been blessed with being known as having "monopoly money". I like the different colors we have! I have a friend who moved to Europe for her husband's job, and several years ago, she came back to the States to visit shortly after the $20 bill had been redesigned (which she hadn't heard about). She went to an ATM to get some money, and she thought she had been tricked by a fake ATM that someone was using to steal bank account information, because it was dispensing what looked like fake money! The US money does look "classic" like old stock certificates or something. As someone who works in the "bill detector" trade I can tell you unequivocally that these redesigns are NOT for the machines. They are for people. The treasury is redesigning the bills so that you and I can more easily tell counterfeits. Additionally, one of the best security features our bills have is the tactile feel of the bill. Since the current design uses the same paper for all bills, counterfeiters can wash the bill (like check washing), and reprint it as a higher denomination. The redesigns will prevent this. [*] In this case should I call them a maroon?